NEW! 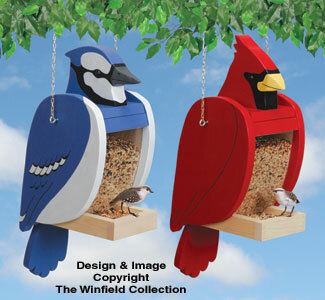 Special Cost Saving 2-Pattern Set These brightly colored feeders will make an eye-catching addition to your yard while feeding your feathered friends. Features include easy-fill hinged head, clear acrylic belly and tray bottom for viewing seed levels and and simple construction. Fun projects to make from our full-size patterns. 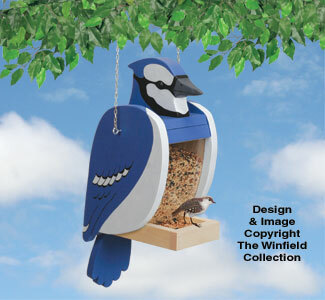 Our Blue Jay-shaped feeder makes an eye-catching addition to your yard while feeding your feathered friends! Please refer to "More Info" for parts used in this project that are available from Winfield. 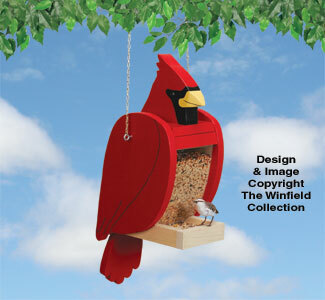 This brightly colored Cardinal-shaped feeder will make an eye-catching addition to your yard while feeding your feathered friends.